If you love Kalamkari, Dwaraka (Development of Weavers and Rural Artisans in Kalamkari Art) is the place to shop at. Bags, purses, stationary, lamps, jewellery boxes, wall art, and more can be scored at very reasonable prices. Hand drawn like the name suggests, kalam (pen) – kari(craftsmanship) with vegetable dyes. The work is inspired by nature and Indian mythology. The colours are vibrant and earthy. 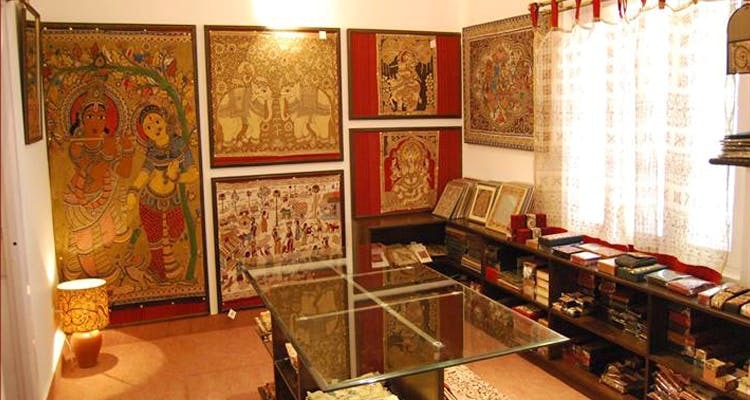 Their bags with Kalamkari fabric in different styles and traditional wall art with narratives from Indian mythology. Anyone who loves all things handmade, textile and handicraft. At Dwaraka, you will find it on bags, clothes, stationary, wall art and much more. Their wall art pieces make for beautiful gifts and are easy on the pocket. You can hang it as it is or frame them in wood.